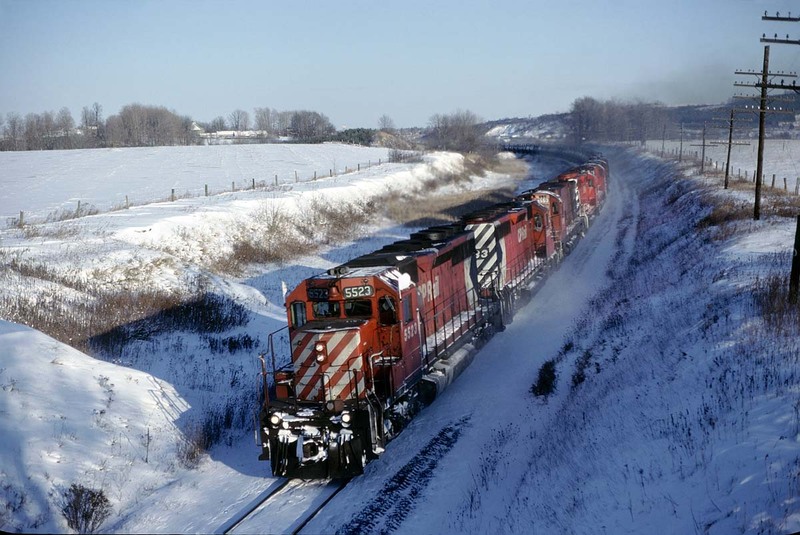 Railpictures.ca - Dave Beach Photo: CP 5523 leading a westbound around a curve just west of Woodstock on a frigid January 3, 1981 | Railpictures.ca – Canadian Railway Photography – photographie ferroviaire Canadienne. Caption: CP 5523 leading a westbound through a curve west of Woodstock on a frigid January 3, 1981. While preparing to submit this image, I realized that although the slide was labeled Woodstock, I did not remember exactly where to locate it on the map. Railpictures.ca's map feature came to my rescue. Not only was I able to locate where it was taken but the image by James Gardiner http://www.railpictures.ca/?attachment_id=17571 is new enough (and mine old enough) to qualify for the Time Machine page. An amazing amount of vegetation has popped up. To answer Mercer’s question, I believe that this was a sulfuric acid train. Was this a sulphuric acid train ?? Ahh, yet another for the time machine. Great show. Ah!! Super Freeze. That explains why my notebook has no photo entries between Dec 30/80 and Jan 9/81 !!! Too bloody cold !!! ) You had more ambition than I. Thanks for the comment about the cold. To be young again. I didn’t think of it when I posted the picture but according to a Wikipedia page, the very next day was the coldest temperature ever recorded at Pearson Airport (“The coldest temperature recorded at Toronto Pearson International Airport was −31.3 °C (−24.3 °F) on January 4, 1981, and the coldest windchill recorded was −44.7 on the same day.”). It wasn’t much warmer on the 3rd. We were in Toronto that night; I was shocked that the car started. Nice. I just get to thinking we won’t go to the store for a bag of milk in miserable cold weather, but think nothing of freezing our (bleep)s off waiting for a train in same.